What if there was a kind of camera that could put a 3D model of you in VR or AR, in realtime? That’s exactly what Holocap is, and it really works. Holocap is a system for realtime holographic capture for VR and AR. It uses an inexpensive Kinect sensor and Unity software to create a 3D model of you in realtime, which can be viewed in VR or AR. Holoportation has been demonstrated by Microsoft before, but they used several depth-sensing cameras and powerful computers. 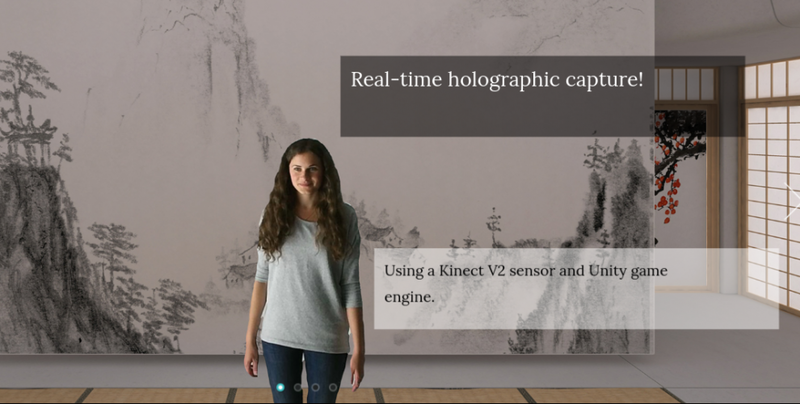 In this case, Holocap is using very modest and affordable hardware and software — a Kinect version 2, and Unity software — to do something similar to Microsoft’s holoportation. I got to try it myself at VRLA and it really works! When a viewer wears a VR headset, they can see a 3D model of you, as if you’re in front of them. They can crouch, jump, move sideways, etc. They can view the sides of the holographic capture as well, although the back part, which is not in view of the sensor, will not have a 3D model and will instead appear as if the person is “extruded” from the background. I was also impressed that there was almost no noticeable lag between the time of capture and the time of display, making it possible to communicate with the other person in realtime. Here is Holocap’s official website.